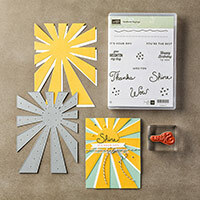 The Sunburst Sayings Stamp Set and coordinating Sunburst Thinlits Die can be purchased together in a bundle to save you 15%. There are so many possibilities to use them together or by themselves for all types of projects. 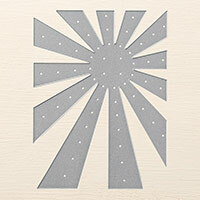 I hope you get some inspiration by the video made by Stampin' Up! showing you these two products. Today is a Workshop Day for me, so I don't have time to post a project of my own, so I hope you like the video. I have listed below the products as they would be to purchase individually or as a bundle. You can also purchase this in a Wood Mount Set and Bundle with the Wood Mount Set. 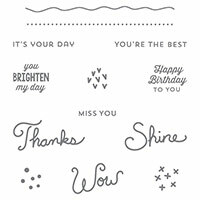 Wood Mount stamp set is $25.00 and the bundle would be $45.75.